Sharonda Harris-Marshall is a writer, photographer and filmmaker. Harris-Marshall received her Bachelor of Arts degree from the University of Southern California and her Master's in Liberal Arts degree from Spring Hill College in Alabama. She has been a story-first creator ever since. She currently writes content and produces videos for nonprofits, startups and small businesses, including NOVAC, Medium.com and Nebraska's own Askarben Race Track. 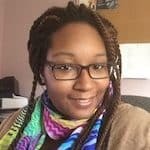 Harris-Marshall is an Alabama native who currently lives in Nebraska, where she spends her free time cooking good food and trying new adventures. If you value education for your children over anything else, check out these Omaha apartments. If you’re a foodie or a host with the most, you don’t want to live far from a grocery store. If you and your furry friends want to call Omaha home, you’re in luck! If you’re a healthcare professional in Omaha, here are the best apartments near medical facilities. There’s no shortage of prime apartments in Omaha near art galleries and exhibits. Omaha is full of outdoor spaces and walking paths, and the people of Omaha take advantage. If you want to be in the action, here are the best Omaha apartments near nightlife. If you’re a coffee lover, here are the best apartments in Omaha for you.